Courgis (Chablis, Burgundy), Domaine Alice and Olivier de Moor. Working with organic viticulture techniques in such northern latitudes as Chablis is rare. Of course, there is the higher rainfall to explain that, the region getting something like 700 ml/year, which is much more than the Loire or the Cote d'Or. But other, more cultural reasons explain the difference : Vignerons in this part of Burgundy (Chablis, the Yonne departement) have a different way of thinking, are maybe more reluctant to take some risks, and also the size of the estates here tend to be bigger than in the Cote d'Or part of Burgundy, where smaller surfaces allow more easily ventures into non-chemical farming. 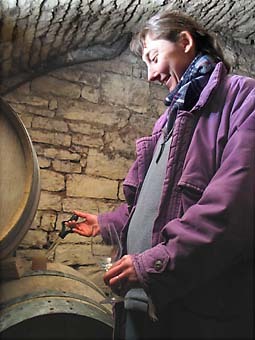 Domaine Alice et Olivier de Moor is an estate where from the beginning the owners worked hard to apply these all-natural methods in the vineyard. They began progressively, first replanting fallow plots in 1989. They had their first bottlings in 1994 and the winery was really started in 1995. The first years were a time for testing different ways , techniques and trials in this organic-minded viticulture. 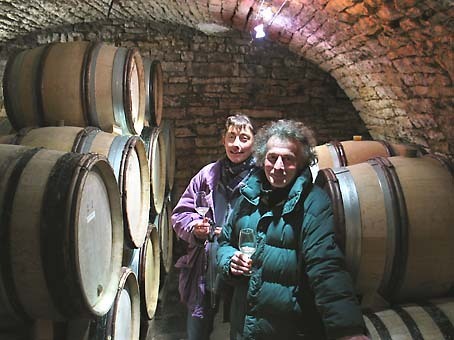 They had no mentor, no other organic estate in the vicinity to get help, advice and training like they could have had in the Loire or in southern Burgundy. They now work on a 7 hectare vineyard spread on 4 Appellations( Bourgogne Aligoté, Sauvignon Saint Bris, Chablis, Bourgogne Chitry) and proved after a few years that it was both possible to conduct such an agriculture in these latitudes, and make remarkable, authentic wines. Their estate is controlled by the organic-farming certification bureau Ecocert. 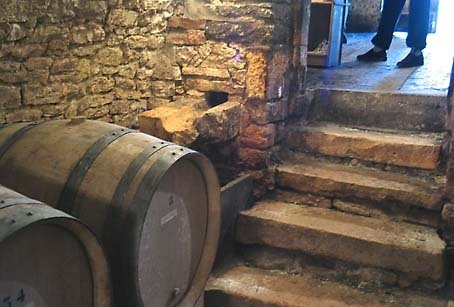 Recognition of their wines among consumers and critics came after someone at Caves Legrand, a reference wine store in Paris, tasted and bought them. Their wines were spotted at about the same time in the U.S. by wine critics through their then importer Peter Vezan. For our part, we discovered their wines once more through the Caves Augé, a Paris wine store with a wide selection of natural wines. 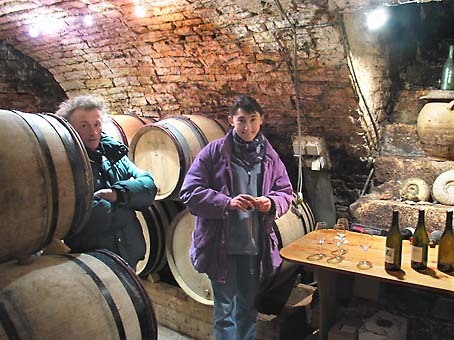 We met Alice and Olivier at their cellar in Courgis, a village located 7 km south of Chablis, on a cold winter day. __1 Aligoté 2005. Yellow, turbidity (cask has been moved recently). The wine has still something of the bernache, in the mouth. Good to prepare the mouth for the following, Olivier says. __2 Aligote 2005. Same grape variety, other cask. Vines more than 100 years old. Still unstable because of residual sugar. Will be bottled next autumn. They want to show what can be done with Aligoté, especially when made out of old vines. This can be very different from the ordinary Aligoté usually considered as an ordinary, acidic wine. Olivier adds that people forget that there was a time (1936) when Aligoté was widely planted on what is today Aloxe-Corton Appellation, for example. This grape variety is indeed more difficult to handle, it is irregular in its yields and needs a very precise anticipation in the winter pruning so as to avoid to resort to a green harvest (which needs 150 hours/hectare). __3 Chablis 2005. 3 small plots of Chardonnay, with grapes pressed together because of the tiny size of the plots . Very clear white wine. Freshness, aromatic too. Some richness. Minerality and lenghth. Nothing but fermented grapes... The press is a traditional horizontal Vasselin press. Harvest is manual, with boxes. Fermentation starts during the 1st week, sometimes slowly. No external yeasts added. They say they are not afraid of oxidation. winemakers usually here want to avoid aromas of dried fruits, almond, walnut, as opposed to citrus, pear. But 20 or 30 years ago, there was no problem with having this almond aroma in the Chardonnay, which is an oxidation aroma. The excessive reference to citrus and fresh fruits aromas in Chardonnay is in relation with excessive protection with SO2. Here, a little SO2 added at bottling in february (18 months after the harvest). Before bottling, the wine stays 4-5 months in vats. __5 Saint Bris (Sauvignon) 2005. It will be labelled as Saint Bris AOC if they get the agreement for the Appellation. 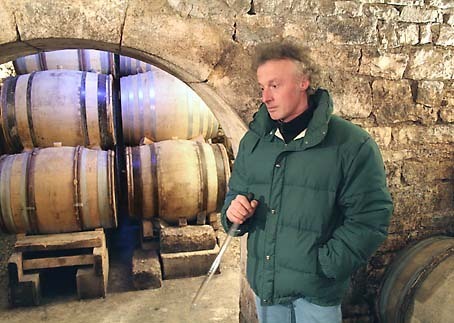 Olivier says that sometimes their wines are considered as too far from the average and from the typicity of St Bris, as it is viewed by the other vignerons, at least. Vigor on the nose, citrus peel. Nice generous mouth, still a little sugar, and some tickling on the tongue. They say they don't manipulate the wines and at the end their wines may be very different from the average : For example, in 2003 (heat wave year) many vignerons had added tartric acid and de Moor wines which had not received any, appeared as more weak. But they just had to check more carefully the wines to keep them safe. And the wines being raised on their lees, pH came back progressively at a proper level. __6 Chablis "L'Humeur du Temps" 2004. From a bottle. "Thirst" wine. This cuvee is not made every year. 2004 was a strange year, quite without summer, even compared with the Cote D'Or, and the grapes were barely reaching veraison at the end of august. But september saved the millesime. Two pickings this year. This is the 1st one here. __7 Chablis 2004 "Bel Air et Clardy"(bottle). Named from two climats. Bottled last november. 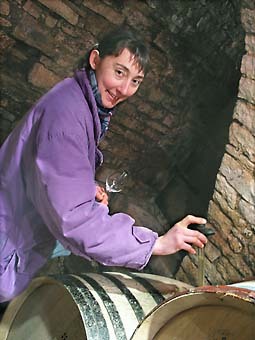 Alice says the wine is still "on the cask" in its expression, with a light vanilla side (in spite of the use of old casks only) which will tone itself down. Nice wine. Silky and full, B. says. __8 Chablis "Rosette" 2004. Bottled two weeks ago. A hint of turbidity (wines are never fined, never filtered here). Silky. And still this mineral side. __9 Chablis "Rosette" 2003. More "imperial", this is 2003. This wine asks for fine cuisine work, B. says. I like it. __10 Sauvignon. Vin de Table. No year officially, but this a 2003. 14,8°. The agreement was refused for this wine that year. It was supposed to be a Sauvignon de Saint Bris Appellation. Nice minerality. From a vineyard with lots of missing vines (which are replanted). Public price for this Sauvignon : 10 Euro. Yields in the Domaine is 40 hectoliter/hectare in average (2003 was slightly less, at 36). Alice and Olivier also raise two young boys. Thank you for the time and tastings, Alice and Olivier. The export share of their wines is high : 50% to 70%, depending of the year. They can be found in a wide range of european and other countries, including Berry Bros and Rudd as well as Wentworth Vintners in the UK, at Rakuten in Japan as well as through importer Yasuko Goda (Racines), and in the U.S. through importer Vintage59 in Washington D.C. and San Francisco (see their winery profile here). Very much enjoy your wines and am having great success placing them. All the best. Hello, would you be kind enough to give me a contact address for Peter Vezan? I'm enjoying one of your wines from Chambers Street Wines right now. The Aligote. swoon.